The Los Angeles County Metropolitan Transportation Authority (Metro) will provide Dodger Stadium Express bus service for the World Series against the Boston Red Sox beginning this Friday for Games 3, 4 and 5 (if necessary) at Dodger Stadium. Fans are encouraged to arrive early with large crowds expected, especially near game time. The Dodger Stadium Express is free for those with game tickets. Regular Metro fares apply on all other connecting bus and rail services. Service from Union Station will be provided starting three hours prior to the start of the games and ending 45 minutes after the close of the games. Service from the Harbor Gateway Transit Center will be provided beginning two hours prior to the start of the games and ending 45 minutes after the game is over. The Dodger Stadium Express from Union Station will pick up Dodger fans every 10 minutes in front of Union Station. Service will continue to Dodger Stadium via Sunset Boulevard and Cesar Chavez Avenue. Passengers will be dropped off and picked up at one of two stops, either behind center field at Dodger Stadium or adjacent to the Top Deck. Dodger Stadium Express service includes a dedicated bus lane on Sunset Boulevard, where game day traffic congestion is the heaviest. The service to all home games throughout the season is paid for by a grant from the Mobile Source Air Pollution Reduction Review Committee (MSRC). The MSRC awards funding within the South Coast Air Basin from a portion of the state vehicle registration fee set aside for mobile source projects that result in emission reductions from cars and trucks. Funding for the Harbor Gateway Transit Center service is provided by Metro. In addition, Metro has released its annual baseball playoffs video in which a bus maintenance employee soils a pair of literal red socks while cleaning a bus. The video is a continuation of a public transit MLB playoffs tradition that began three years ago. 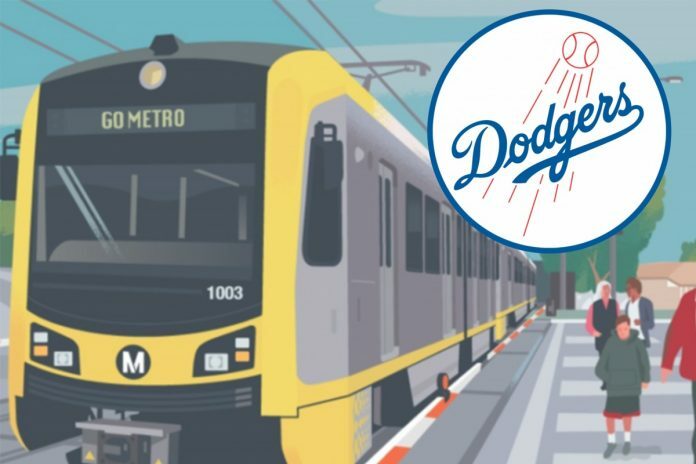 Thanks to successful Dodgers playoff runs in recent years, Metro has previously gained notoriety for light-hearted ribbing with the CTA (Chicago), NYCMTA, BART (San Francisco) and MCTA (Milwaukee). It’s all meant to be in good fun, of course. The videos and related content are produced to draw attention to the Dodger Stadium Express bus service that takes baseball fans from nearby downtown Union Station in Los Angeles to Dodger Stadium and back.